Still Life Paintings | The Messy Palette . . . In the last post, I shared the bottle painting—initially thought to be a failure but then, after a water bath, not so bad after all. I had attributed the shiny reflection to that desperate act of dousing the work with water. After much deliberation and messing about at my art table, it dawned on me: It was not the water bath that added to the shine. In that painting I’d used a substance called Gum Arabic which is known to add ease of flow, and shine when applied to with paint. How exciting to have an “art epiphany”! Now I can “shine” whenever the mood hits. 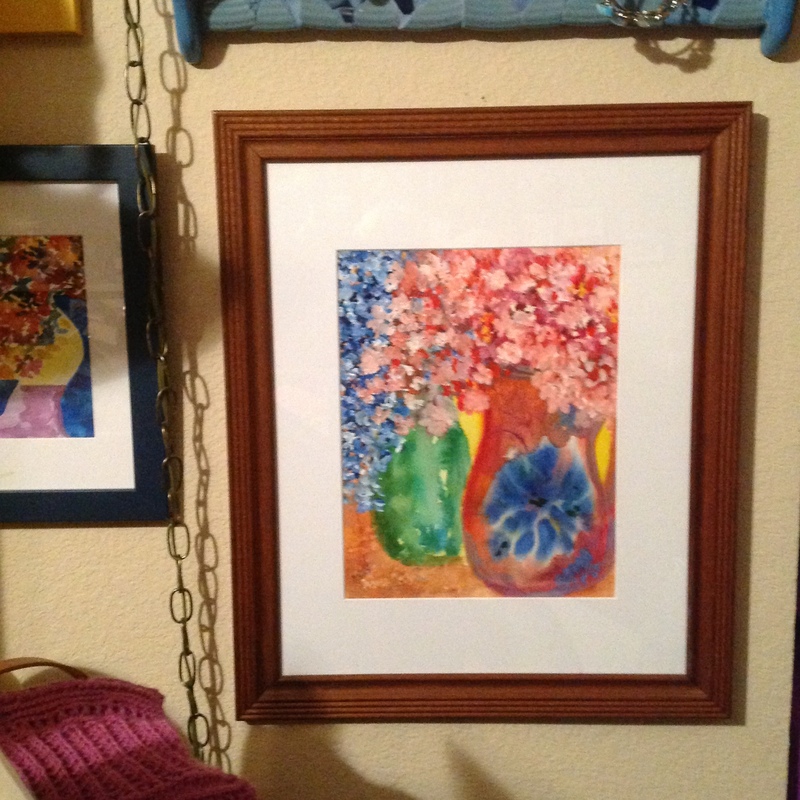 After framing these bottles and hanging the painting near the aforementioned big one, I kept looking at the smaller painting and thinking BORING! It was too “ploomp, ploomp, ploomp”, like those disgustingly trimmed and groomed evergreens planted around commercial buildings and clinics—or a battalion of hostas marching in a row, planted because someone had no concept of anything more wild, lovely, free, and imaginative to plant in the shade. So I unframed the above and invested another half hour in messing about, arriving at the conclusion pictured below. Now, I LIKE it! It belongs on the wall with the 24″ x 20″ original—Gum Arabic and all. Oh, so much better! NOTE: Here is the wall. After a few days of studying the paintings, I realized that the painted bottles were in sync with a shelf of real glass bottles in cobalt blue. This painting, matted and framed to 24″ x 20″, is obviously too large to scan on my printer. I would have to take it to Office Max or whatever, and I just don’t want to do that. So instead, I propped it on the couch and photographed it (without the glass) with my I-pad, emailed it to myself, and violà. Here it is. The painting, “Dans la Fenêtre” (“In the Window”), has an arduous history in its making. I’ve been working on creating reflections, shadows, and the look of a wet still life or landscape. 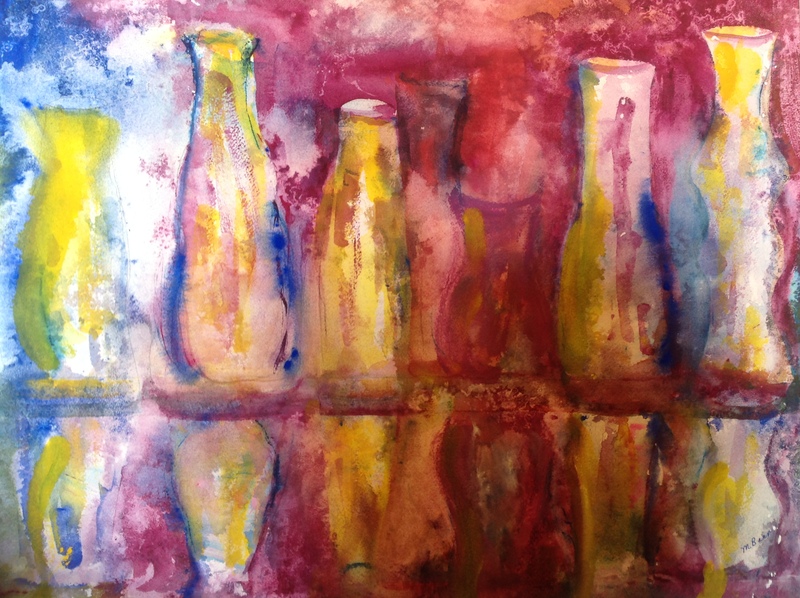 Here I set out to simply do some bottles and their reflections. Then I began negative painting, around the shapes rather than starting with the actual bottles I’d so carefully transferred onto the paper. 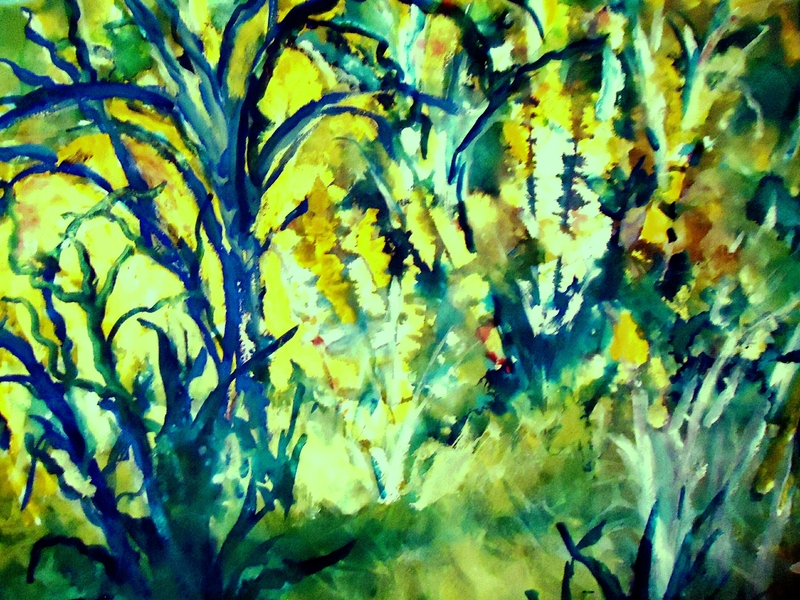 The negative painting (background) grew more and more atmospheric as the colors blended. 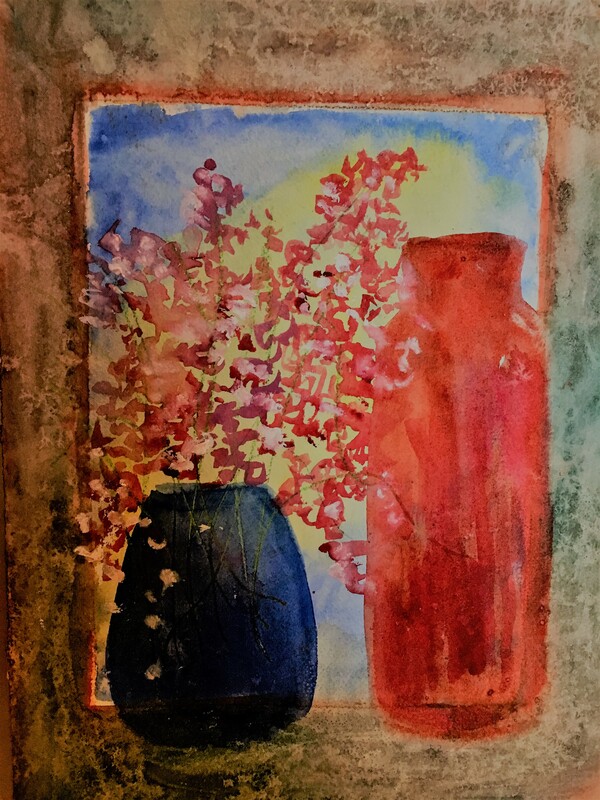 Next, I dropped quinacridone gold, shades of magenta and opera pink, and a touch of French ultramarine into the bottles to reflect their setting. These merged and did their own thing which was to create a rusty, well-worn appearance. Meanwhile, the background had grown a bit muddy so I washed a film of white gouache over the negative painting and into the bottles as well. Suddenly I realized this was about the ugliest painting I’d ever produced. I was disgusted with myself for (what I thought was) having ruined a large paper. The back side was also a mess from the paint overflow which had seeped in from the table. What to do!!!??? By now it was 1:00 a.m. and I was exhausted. I ran a few inches of water in the tub, thinking the piece was too gooey to put in the garbage with all that mucky paint on it. A good rinse would make the disposal a neater operation. Having rinsed, I left the paper to dry off while I slept. Tomorrow (now “today”) I would throw it out. In the morning, when I went to pick up my disaster, I was stun-gunned. Whatever anyone else might think, I felt this was an amazingly wonderful accident. I loved the painting. Somehow the gunky look had been washed off, exposing the original colors that had been applied. The rinsing created a shiny reflection, much like the mirror image of the bottles was sitting in water. To complete what I now felt was a huge victory, I slightly dabbed outlines here and there on the bottles—to add a hint of structure. What had started out as a very structured piece had become illusory* so the Inktense® Colored Ink, Water Soluble pencil lines simply propped the bottles up a bit. Here is the framed painting on the wall. The photo of the picture behind glass does not begin to do justice to the life, light, and shine in the piece. I had to photograph it in the evening, because in the daylight the glass reflected and transferred everything on the opposite wall onto the image of the bottles. It was borderline hilarious. But you can get an idea. I will try to achieve this effect again, although it is challenging—sometimes impossible—to reconstruct an accident! At least I’ve discovered one more way to salvage a less than wonderful effort: just float it and douse it with water. These a only a few of my watercolor paintings which have been enhanced with gouache, a water soluble medium which is opaque unless greatly thinned with water. Gouache does not dry permanently, as does acrylic paint; thus it really is a watercolor and it needs to be preserved behind glass. But gouache adds heft and body, when desired. In fact, gouache is also called “body color”. More and more, I am adding some gouache to my foundation of transparent watercolors: either a touch here and there, or larger areas built up to accentuate texture and brushstrokes. My goal is to achieve a resemblance to the richness of oils. I do have water-soluble oil paints, and have used them on occasion. But the lengthy drying time puts me off, as I don’t have a lot of excess space in which to store works in progress. Also, I don’t want to completely abandon transparency. So transparent watercolors and gouache are the perfect combination for me. And I think I have fallen in love with gouache! Of Miracles . . . . When we lived up north a decade ago, I was part of a local writers’ group. One of the members was an artist, and he had paintings on display in an area hospital. At the time I thought that was the ultimate. How wonderful for this man, how amazing! I was totally absorbed in writing and self-publishing my book of essays and poems, A TIME UNDER HEAVEN. It never entered my head that in just a few months I would pick up a paint brush, and consequently begin an entirely new life adventure. I’d always enjoyed visual art and thought I would love to paint, but I kept telling myself I didn’t have any talent. Upon mentioning this to my friend Dee, she said “Why don’t you just do it?”. Something snapped that day, and I decided who cares about “talent”? I’m just going to have fun! When we moved to Southern Wisconsin, I joined PAAC—the Pewaukee Area Arts Council, a group which promotes many disciplines including photography, creative writing, and music. I had thought my thrust would be what it always has been, writing and especially poetry. But one meeting called for participants to bring paintings for Show and Tell. A couple of artist members honed in on my watercolors and urged me forward. To this day, I’m grateful for that encouragement*—and to my friend, Dee, who gave me an initial shove! 1) The gallery opportunities keep me painting purposefully nearly every day, a work which I enjoy immensely and find infinitely refreshing. My desire is to hang something new every single time, in every place, rather than rotate a painting from one site to another—something I could do if necessary but would rather not. 2) The paintings are growing larger! Whereas my max was previously 16″ x 20″ (outside mat size), I’m now venturing into 20″ x 24″. One of the gallery sites contains a long, high wall. The 11″ x 14″ renderings which I happily hang in our home might get lost in that exhibition. Larger pieces are appropriate for the other galleries as well. And BIG is FUN! The above watercolor and gouache, “Sunspeak”, is “hot off the palette”, and framed in a 20″ x 24″ ready-made dark blue frame. Beautiful ready-made frames are available at the BEN FRANKLIN store a few miles from our door. Colorful frames have consistently dominated our walls at home, but suddenly I began to crave the mellow warmth of wood—maybe because we’ve had winter/winter/winter around here since early November. Now my husband and I have begun to explore the St. Vincent de Paul Thrift Store (actually there are two of them close by) where we find lovely wooden frames for the proverbial song. A measuring tape has taken up permanent residence in my handbag, and we search and measure at least once a week. Joe removes the backing—paper or thin board, staples, whatever, and secures the hanging wires on the frames. I line each frame up in Joe’s work area—either vertically or horizontally so he knows which way to attach the wire. My art is a series of baby steps, I know. There are real artists out there with real training and real ability! But every little baby step is a MIRACLE! *NOTE: I can’t say enough about the value of encouragement. I’m continually amazed by the generosity of artists I’ve met—people whose work far exceeds my wildest dream. Quite honestly, I didn’t always experience encouragement from fellow writers; my writing approbation came from contests, sales to magazines, and from people who enjoyed reading what I wrote. I’ve often pondered why that should be so. Perhaps writers tend to be more introspective than a lot of people and thereby preoccupied with whatever they are thinking. I admit I’ve been that way at times—especially when processing the deeper things in life. But to encourage another person is such a joy! I’ve basked in that joy through teaching writing classes over the years. Like writers, visual artists are tuned in to the world around them—to seeing and experiencing. But then writers must retreat into the process of distilling their gleanings into words. Words are miracles too, But writing is a LONELY craft, at best—and it does demand periods of detachment. We may be satisfied with our words, while wondering if anyone else will ever read them. And maybe no one ever will—thus the conduit to sharing is severed. Conversely, artists translate their impressions into explosions of shapes and color. Regardless of level of expertise or lack of it, these visuals provide gratification. We are tremendously fulfilled when we are pleased with our colors and shapes. We can SEE our work, and others can see it as well. Varieties of art are endless; each one of us is unique. This very fact, plus the perk of seeing with our eyes, may create a glorious freedom to encourage others, and be encouraged!